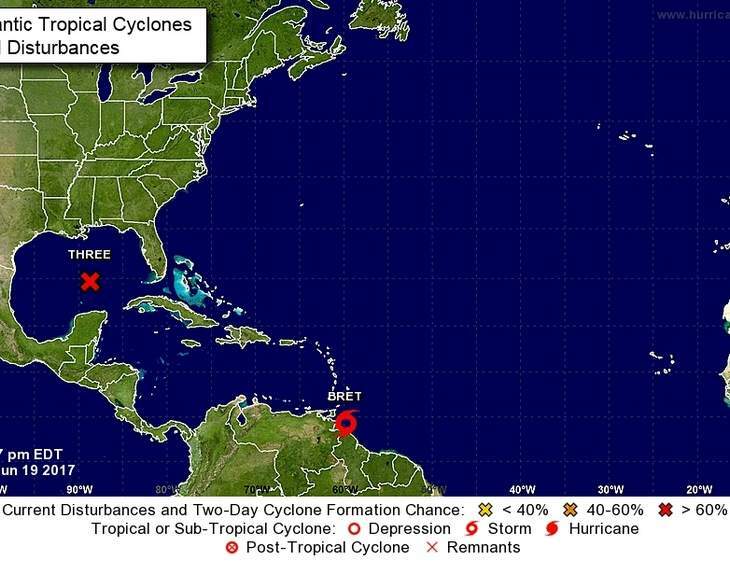 (Trinidad Express) Tropical Storm Bret has formed east of Trinidad and Tobago, and it is already causing damage. Several roofs have been blown off homes in east and south Trinidad. According to the National Hurricane Center’s website, an Air Force hurricane hunter mission flew into the weather system on Monday afternoon and made the determination. It is the second named storm of 2017. According to the National Hurricane Center, the system was located 362 kilometres southeast of the islands of Trinidad and Tobago and Grenada, with maximum sustained winds of 64 kilometres per hour. 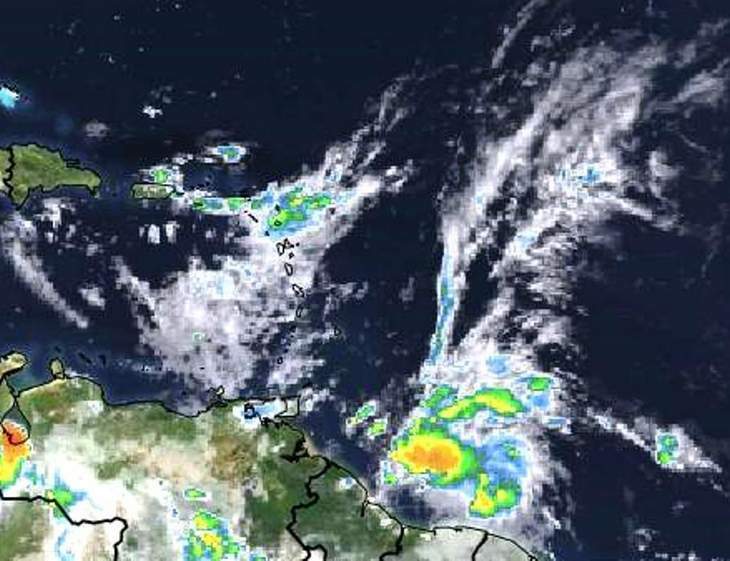 The Meteorological Services of Trinidad and Tobago has since confirmed that the Tropical Storm is moving west north-west at about 48 km/hr and is expected to continue at a slightly slower speed for the next 48 hours. Little strengthening is expected over the next 48 hours. On the forecast track, the system is expected to pass over Trinidad and the eastern coast of Venezuela tonight into early Tuesday. But there are reporting from San Francique of a roof being blown off a home/business, a roof being lost in Sangre Chiquito near Sangre Grande and trees being torn down in Matelot on Trinidad far north coast. From midday, thundershowers and strong winds were being reported in some areas of the country. The initial scepticism by citizens some during the morning was replaced by concern by afternoon after multiple bulletins came from the Meteorological Services of Trinidad and Tobago which continued to warn that the weather system was maintaining strength and direction towards Trinidad and Tobago. Tobago acted early, with the THA advising all employees except those in essential services to stay at home on Tuesday, and closed schools. Caribbean Airline also cancelled all it’s afternoon flights on the airbridge, leaving hundreds of passengers stranded, and also cancelled several international and regional flights. The authorities in Trinidad acted hours later, with the Education Minister advising that all schools would be closed on Tuesday and the Health Ministries cancelling all elective surgeries and informing citizens that all health centres would be staffed on a 24-hour basis once the storm hit. Supermarkets reported an increased number of customers stocking up on candles and non-perishables and fuel stations saw long queues with motorists filling tank in the event of major power outages. Another bulletin is expected to be issued on Tropical Storm Bret at 9p.m. Monday.